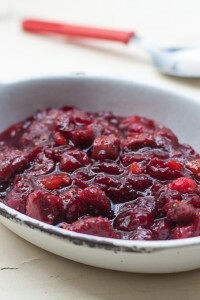 At first, I thought that I was a little late to the party, posting a cranberry recipe after Thanksgiving had passed. Then I realized that now may be the actual best time to post a cranberry recipe since after Thanksgiving there is usually a glut of cranberries on the market, and prices drop after the Thanksgiving. Well, at least in America. I was fortunate because although you can find fresh cranberries in Paris around Thanksgiving (for les Américains, and with a little searching), they’re very costly. And even after the fête, they don’t discount them since the sellers don’t quite realize that the stress of having to find fresh cranberries is not longer an issue once Thanksgiving has passed. And most of us tend to forget about them. However I love cranberries and hoard them whenever I find them at a reasonable price. Like last year, as a fluke, I was at a supermarket and saw baskets for only €1 each, about $1.25. (Marked down from €6 each, or — gulp — $9 a basket.) So I swooped down, and bought them all. And for the holidays this year, I had a freezerload of fresh cranberries at my disposal. A few weeks ago, a reader contacted me, asking whatever happened to the cranberry-raisin pie recipe on my blog. I did a search and, indeed, the recipe was gone. When I moved the site to a real blogging platform around 2004, the old pages from my “blog” (which back then was simply a website that I updated as much I could, before I knew what a blog was), couldn’t be moved over. So like the proverbial dog eating someone’s homework, I could say that the internet ate it. I searched around the Way Back Machine for posts on the earliest version of my site, to no avail. But finally found the recipe lurking in some dark corner of my computer, waiting to be re-released from an obscure file that, fortunately, I’d saved. This recipe is from Marion Cunningham, who was responsible for revising and updating The Fannie Farmer Cookbook, an American classic that was too heavy to lug to France. The recipe is as easy as – well…pie. And while that’s a commonly used expression, this time I really mean it. There’s no slicing or peeling; you simply mix up some cranberries and raisins, enclose them in two sheets of pie pastry, and then bake it until the juices thicken. And then, ya got pie. Once done, the filling has the tart, tangy taste of cranberries with little nuggets of sweet raisins, along with a hint of orange flavor, thanks to a generous splash of orange liqueur and zest. Unfortunately, I can’t show you what it’s like inside for two reasons. But, silly me, I brought my camera to dinner and when dessert was ready to serve, it wasn’t the Champagne (‘Tis the season!) and Chablis kicking in, but it was me (ma faute), who forgot to click the battery into his camera before leaving home. (I was so concerned about the pie on the métro since I’ve had so many jostle-related accidents in the past.) So you don’t get a shot of the inside, but imagine an almost jam-like filling, thick and juicy. 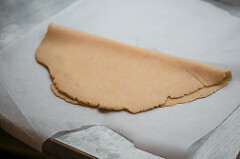 Adapted from The Fannie Farmer Cookbook by Marion Cunningham, pie dough from Ready for DessertI’ve been on the fence about rolling pastry on a lightly floured countertop versus between two sheets of parchment. Here, the parchment won out. If you choose to go that route, rather than rolling it out the traditional way, make sure the dough comes back to close to room temperature before rolling it out. I find it helps to unwrap the dough, then hold the disk so it’s perpendicular to the counter, and rap it on the counter, turning it as you go. That helps soften just the edges of the dough, and prevents them from cracking when you roll it out.The orange liqueur is pretty important for the taste, but you could use Cognac or brandy. If you’re avoiding liquor, fresh orange juice would work in its place. 1. 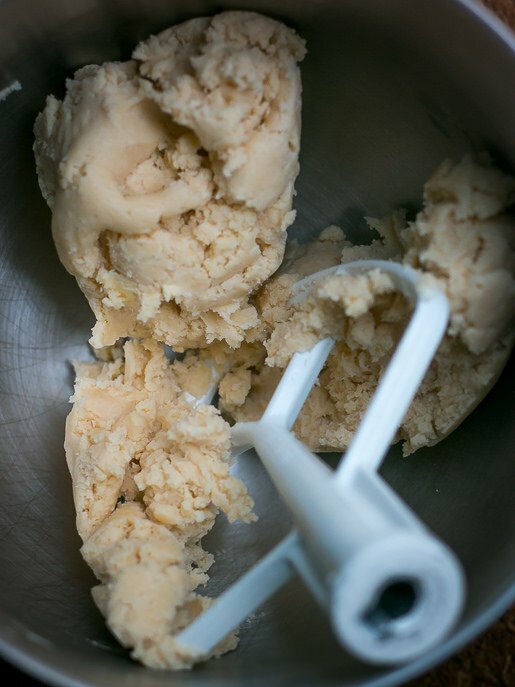 To make the pie dough, mix the flour, sugar, and salt in the bowl of a stand mixer fitted with the paddle attachment. (The dough can also be made by hand, in a bowl, with a pastry blended or using your hands.) Add the chilled butter and mix the dough until the butter is broken up into small pieces, about the size of peas. 3. When you’re ready to assemble and bake the pie, preheat the oven to 400ºF (200ºC). 4. Make the filling by draining the raisins and squeezing them to get the excess liquid out. In a large bowl, mix them with the cranberries, sugar, flour, orange liqueur, and zest. 5. Remove the dough from the refrigerator and let it come to slightly cooler than room temperature. Unwrap the smaller disk of dough, rap the edges on the countertop (as explained in the post), the roll it between two pieces of parchment paper until it’s a 12-inch (30cm) round. 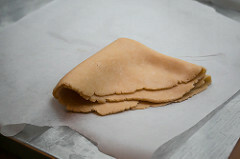 Fold the dough in half, then fold it again. 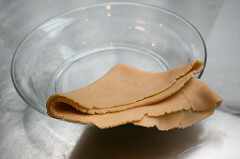 Place it in a pie dish with the point in the center, and unfold it to line the bottom of the dish. 6. 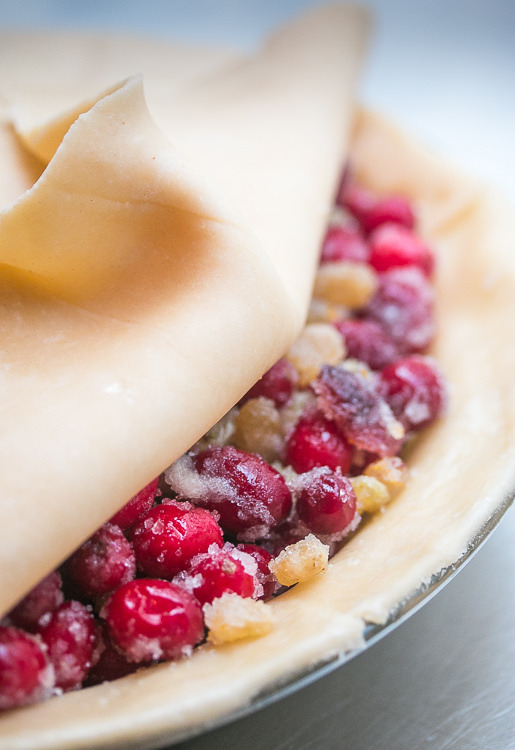 Transfer the cranberry filling into the bottom of the pie shell. 7. 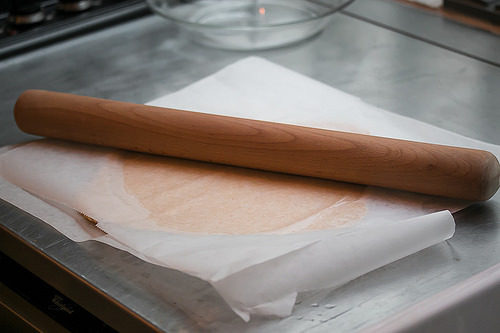 Roll the second disk of dough into a 14-inch (35cm) round between two sheets of parchment paper. Brush the edges of the dough in the pie dish with water, then transfer the sheet of pie dough, to cover the fruit in the pie. Tuck the edges of the top piece of dough under the rim of the bottom round of dough in the pie dish. Crimp the edges. 8. Make the egg wash by mixing the egg yolk with the milk and brush it over the top of the pie. 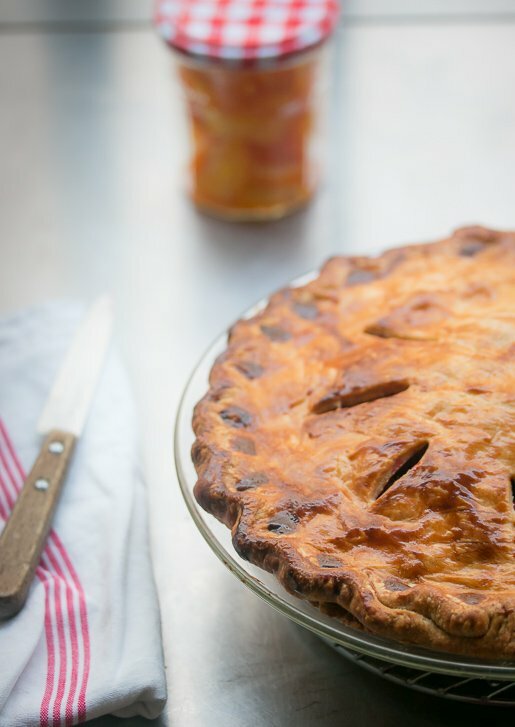 Cut 6 vent holes in the top, place the pie on a foil or parchment lined baking sheet (to catch any drips), and bake the pie in the oven until the top is browned and the juices from the filling are thick and bubbly, about an hour. You can stick a knife in the center to check to make sure the cranberries are cooked, although you want to make sure the juices are thick. If the top of the pie browns too quickly, before the filling is cooked, drape a sheet of foil over the top to prevent it from getting too dark. 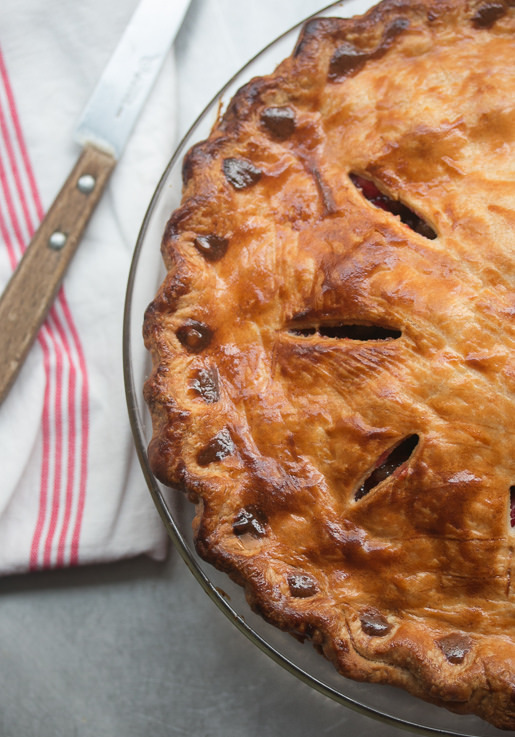 Your pie is beautiful — it’s ok that we don’t get to see inside… Are those little raisens or cranberries pressed along the edges before you baked? I’ve never seen that done before. My mother has been making cranberry raisin pie for my entire life (50 years). She makes about 6 of them every Thanksgiving with a lattice top. Very unique and very delicious. I’m happy to see this on your site. Thank you! Looking forward to trying that recipe, fresh cranberries are a favorite. I usually buy about 10-15 bags when they’re in season and freeze them so I have them all year. (I’ve never known the price to go down after Thanksgiving, but I live in hope.) And that is one beautiful crust. Looks like a slice of heaven. Love tart/sweet combos. To have a freezer in Paris with space for last years cranberries? I’ve never tasted cranberry pie. I have to try it since I love cranberries. Your crust looks fantastic. How do you transport a pie in the metro? The is a recipe that my family has enjoyed for years. It has sort of a cranberry mincemeat flavor. I have added candied orange or lemon. ( either påte sablé or påte brissé) for 1 9” pie. Combine sugar, flour, salt, and boiling water. Bring to boil stirring constantly. Stir in cranberries, raisins, and lemon peel. 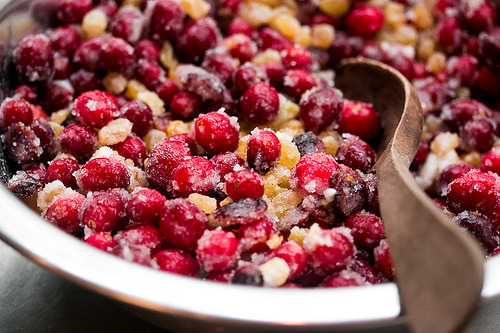 Cook over medium heat until cranberries pop – about 10 minutes. Remove from heat. Add butter and allow to cool about 5 minutes. OMG David THAT LOOKS SO AMAZING! Definitely going on the Christmas bake list! I also was looking for another recipe that seems to have disappeared from your site. You had made yourself a coconut cake for your birthday. I really wanted to make it. Any chance of that making a reappearance??? ;-) Thanks for all the great blogs. I really enjoy reading about all your trials and tribulations residing in Paris too-always good for a giggle! And with the advent of Pinterest, no recipe will ever be lost again! The pie sounds wonderful, and wonderfully easy. I think I’ll use the last of the cranberries for this instead of the two mallards they were originally planned for. Hi David, dang this looks good. We grow cranberries here on the Washington coast, so it’s always nice to find something new to do with them. Love your posts, recipes and delicious wit. Thanks for sharing! A beautiful pie! Can you share the secret for the “dots” gracing the edging of the pie. They really make the pie more beautiful and I’d love to try to re-create it. You mentioned a pie and cake carrier in the Cranberry-Raisin Pie blog. Would you please post a picture of this transporter? Happy Holidays from sunny (so far) SoCal. Looks beautiful…love the sweet-tart combination and buttery crust. Anne: If you click on the link in the post, it’ll take you to her site and you can see the different designs and patterns she makes. Wow, I thought I was the last cook on earth who prefers making pie dough in the mixer to making it in a food processor or by hand as in most contemporary recipes. Zut!….I cannot find the fresh cranberries this year (fresh or frozen) in my local supermarchés or our village outdoor market (near Genève…French side)…Could one possibly substitute airelles or groseilles?…I can find those frozen!! The crust simply must be attempted as well…so golden and, I’m imagining…flaky perfection!! Long-time follower and bonafide fan of your culinary genius..
Hi David, back in the 1930-40’s my grandparents operated a restaurant in Meriden, CT where my grandmother baked all the pastries that were served. One of my favorites was her “Mock Cherry Pie” – identical to your Cranberry-Raisin Pie. I had lost the recipe in the loong intervening years and am so happy to see this posting! I, too, gather all the fresh cranberries I have room for in my freezer in order to have them available the rest of the year. Cranberries for me in Canada mean Christmas more than Thanksgiving! Couldn’t get them in the UK 40 years ago so we used red currants with the turkey…. Cranberries are so versatile though. Thanks for the recipe. I’ll send you cranberries if you send me endive. In Portland, Oregon I just paid $5/lb. guess you need to love the one you are with, n’est pas? Thanksgiving dinner and they asked to take the remaining sauce home to have for breakfast with croissants. I’ve honestly never heard of cranberry pie, apart from the Cranberry Apple you see every now and again, but this looks fantastic. And I just happen to have quite a few cranberries leftover from Thanksgiving that didn’t make it into the sauce. Thanks so much for sharing! David, I am in Paris and wanted to get you to sign a book. How can I contact you? 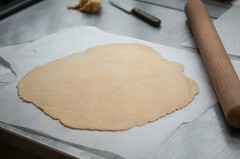 I have always used a piece of light canvas to roll pie crust on (you can use heavy canvas, too, if you have any). You prepare the canvas by rubbing some flour into it first. I like it because, 1, the pie crust doesn’t stick to it at all and, 2, It’s really easy to clean up — you just tap off any excess flour, then roll it up, flour-side in. If you aren’t going to be making pie crust again for a long time, you can throw it in the washer, but then you will have to prep the surface again before you use it. If I don’t have my special piece of canvas, a sturdy dish towel will work pretty well as a substitute. I don’t quite get why people roll stuff out on wood or stone. They always seem to stick a bit and they are much more time consuming to clean. David, I have done you marmalade, and hope to do the kumquat one. I am in Paris now for a few days, and would like to get one of your books signed. How do I find you? And where is that kitchen equipment place? I love the sound of this recipe but I was wondering if there was something that could be used in place of the raisins? I have several family members who are not fond of them. I first baked this pie from my mother’s copy of the Fannie Farmer cookbook edition ca 1935. At that time it was made with dark raisins and after soaking the raisins in wine (I think), they were simmered with the cranberries and sugar before pouring into the crust and baking. Over the years, I lost the recipe and was looking on line today to see what I could find. I make it with a lattice crust and it never fails to impress. Thank you for the recipe! I’m making it tomorrow. Ody Grant, baking for almost 60 years. You are so right. Now is the time when I crave cranberries the most! Yummy pie! FYI that your book is featured in Boston Magazine’s gift guide. I am sorry about the external link! I was happy to see you featured and not sure if you knew. Please delete it from the comments. Your photos are beautiful, David. Just saw the same cake and pie carrier for sale at Heath Ceramics in the US for 44 bucks! A better deal at 17€ if you live in France. Oh my, my, my! What a beautiful pie! (I really didn’t mean to rhyme) I have got to get to the store tomorrow and snap up lots of cranberries! I know what I’m bringing to the family fest on Saturday! Your crust looks incredible, and you are easily forgiven for leaving your battery at home. If my pie comes out as gorgeous as yours did, I’m posting it on my site! However, I may be aspiring to level I can’t meet! My 12 year old son’s contribution to Thanksgiving dinner is freshly made cranberry sauce, which, by the way, he pours over everything-even spinach salad! Imagine his delight when he gets to make Cranberry Pie-he’s gonna be so excited to add one more dish to his list! Thank you. I have a steel worksurface and use a plastic pastry scraper / doughcutter to remove the flour residue left after rolling out pastry – a quick wipe with a damp cloth completes the clean up. 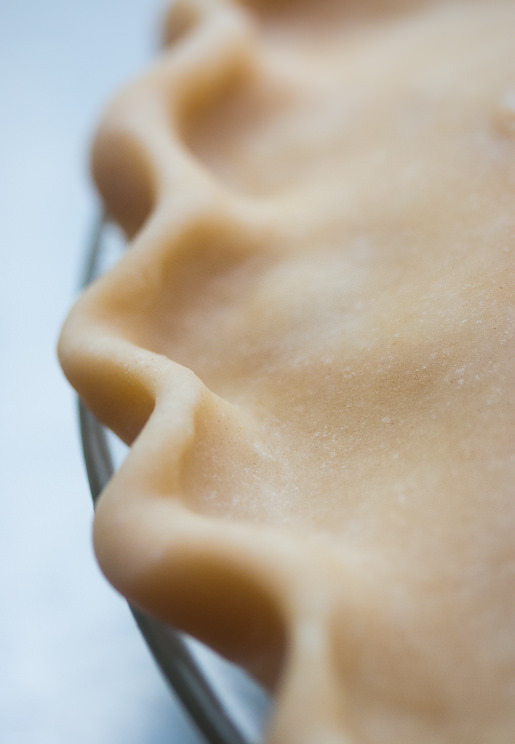 How do you make such perfectly crimped edges in your pie dough? When I first saw this in my inbox, I thought nope not my thing. 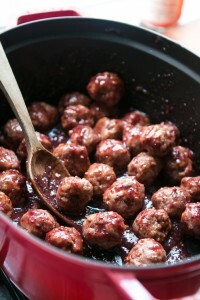 Then read the recipe and now salivating at the thought of this. Mr. L you really know how to make a girl swoon. lovely, lovely, lovely. cranberry time of year is the best time of year. David the Pie looks so yummy. The photos are amazing! Thanlks for this perfect recipe.Love it! I also live in France and a couple of years ago, I found a reduced box of packets of cranberries in a fruit and veg. shop at Gaillac – 81. I asked for a further reduction if I bought the whole box and they quickly agreed. I don’t know how many packets there were, but there are still plenty left. Last night I made Delia Smith’s delicious cranberry relish for an English Christmas dinner for some Polish friends. There’s enough for Christmas Day too. Interestingly, when she first demonstrated this recipe on the BBC many years ago, it caused what is now known as the “Delia Effect”, when the next day, the shops all sold out of cranberries, she has since done it with omelet pans, Marsala, ginger in syrup, tinned chestnuts, rhubarb, cinnamon sticks and the list goes on. I also use my frozen hoard of cranberries in a Finnish fruit cake / pudding. the sourness of the berries contrasts marvellously with the sweetness of the spongy cake base. Lidl in France sell dried cranberries. You make the prettiest pies. Thanks fornsharing this recipe! I love reading your blog! I love reading your blog and this recipe, which I made today, is seasonal, beautiful and delicious! Thanks! I made this as written, with large dark raisins that plumped up nearly to the size of berries in the rich winey juices of the baked pie. A new favorite to add to the winter table–thank you! I plan to make this pie for Christmad dinner. A question: years ago I spent some time in the Southwest of France in May. All the pastry shops sold a pastry that was called Pruneaux (my spelling may be off) and was made with prunes. It was delicious but I’ve not been able to find a recipe anywhere. Has anyone else eaten this and does anyone know of a recipe? It may be Far Breton? I think your version of Far Breton might be what I am looking for. I will try it soon. We enjoyed the cranberry pie, too. Thanks for the delicious recipe. I shared tonight with friends and got nothing but compliments. Thanks for making the darkest day of the year a little brighter in Seattle! Made this pie last night for friends and family XMAS Eve dinner. It was especially nice with homemade vanilla ice cream and everyone gobbled it up. We’d never heard of this type of filling and being from California we wondered if it was a typical East Coast recipe. Also, what do you suggest doing with the leftover trimmings from the crust? It was too delicious to throw away! Almost every Thanksgiving since it first appeared in Bon Appetit in the late 80’s, I’ve been making Julie Sahni’s Cranberry and Fig Chutney with Cinnamon and Pistachios. After Thanksgiving I usually buy a couple more bags of cranberries to make a second batch. 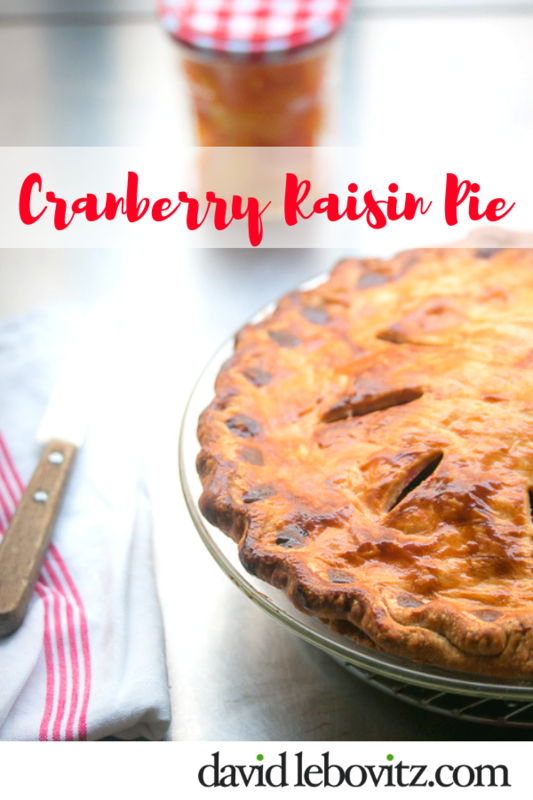 When I saw this pie post, I knew I wanted to try it – and fortunately I already had cranberries in my refrigerator! I made the pie for Christmas dessert. I couldn’t quite imagine how it would taste – but now that I know, I’ll be making it again and again. It’s pleasantly tart and wonderfully delicious! David – What are the yummy-looking small pastries (gold and brownish) near the end of this post? Is the recipe available on your blog? I looked and looked but couldn’t fine any reference to it. 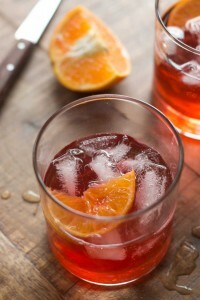 I love your blog; your photos are wonderful and I’ve loved the recipes I’ve tried.